I came up with my own solution to the Moleskine pen holder problem. As a gift to my friend Bryan, I butchered a Moleskin to stealthily hold nine colored pencils and a pencil sharpener. I found several tutorials on embedding other devices in a Moleskin but found that I had made the same mistakes experiences by the other hackers. I painted another pair of shoes, this time for my friend, Jaime Walker. I call them “walkers”. Rather lame, I know. I started with Vans KVD’s, courtesy of Rená at Abbadabba’s. I used the same brand paint as previous shoes and added purple tulips with green stems. I then outlined the flowers with a fine-tip permanent marker. I began by using a “very fine” tip, however the paint dried out the marker tip. I then switched to a fatter “fine” tip marker and with enough finesse, I was still able to draw very thin lines. I decided not to dye them because I have had problems with other shoe-dying projects lately. When dying bright colors such as red and navy blue, both the canvas and the rubber changed color. Also, as I learned the hard way, it is impossible to bleach black canvas Vans white. I tried to make white shoes with black soles by starting with the black/black Vans slip ons. The fabric disintegrates very quickly and begins to rip after coming into direct contact with bleach. Anyways, I learned a lot during this project about delicacy and patience. Its not easy to fix a mistake on white canvas. Slight smudges of purple are obvious in one of pictures below. As a Christmas present, I decided to dye and paint a pair of shoes for my sister. I wanted them to match some clothes I bought her for her birthday. I also knew that I liked the Van’s Prison Issue #23 shoe (which I bought from Abbadabba’s), so I bought RIT Fabric Dye and generic fabric paint. The canvas/rubber combination of the shoe served as the perfect setup to add color without loosing the white soles. 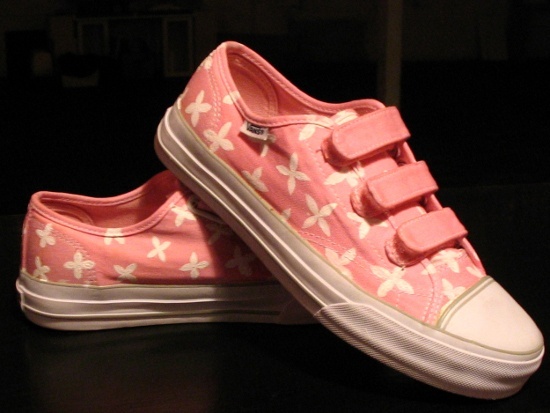 I started with the buff white / true white shoe, dyed it pink, and painted-on white flowers.